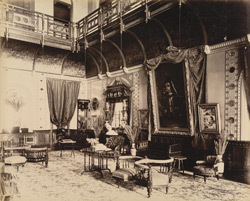 Photograph of the durbar hall in the new palace at Makarpura, near Baroda, Gujarat from the Curzon Collection, taken by an unknown photographer during the 1890s. The palace was built by the Gaekwar Sayaji Rao III (ruled 1875-1939) between 1883-1890 as a country residence, and designed by Robert Fellowes Chisholm (1840-1915) in an Italian Renaissance style. It lies to the south of Baroda and is surrounded by English-style formal gardens. The durbar or royal audience hall interior is a combination of traditional and modern design. It has a viewing gallery at the upper level for women of the court and other observers but is decorated and furnished in a western style. The walls are hung with oil paintings and upholstered Victorian furniture is arranged informally about the room.